Thank you for spotting such a tiny typo. How is your reply helping Mokhaleel? We are all here to ask for help and/or give help. His question is very clear. Even replacing 2018 with 2019 I do not understand your question. I think you misunderstand how the process works. They processed a case with the date of the 5th June, not all of the ones prior. Mokhaleel, that June 4th case they put up there is the “newest dated” case they’re processing, among thousands of cases. It doesn’t mean the “oldest” case in process. 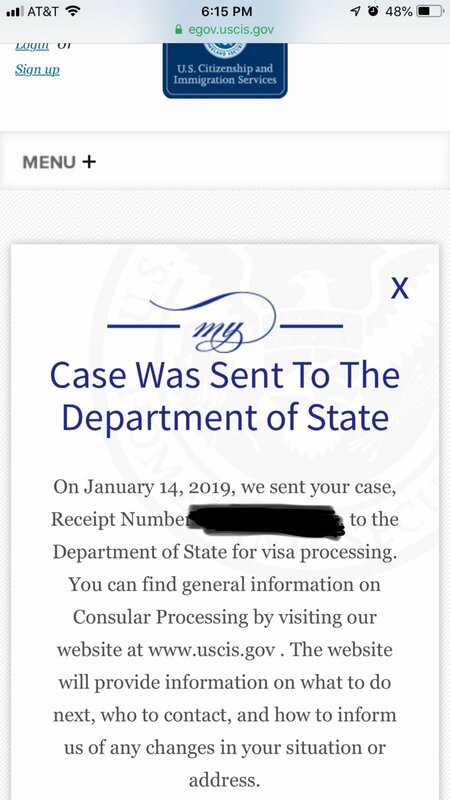 Theorically, the best place to check your status is https://egov.uscis.gov/casestatus/landing.do but unfortunately statuses aren’t updated real time. Many people got approval (or rfe) letters in the mail whilst their status still reading “we have received your case”. Only time I’ve seen a different status there for my mom was “we have sent your case to the department of state” which meant they approved the I-130 and sent it to National Visa Center. We got RFE because in my country, birth certificate is not a hardcopy certificate. You go to Civil Records Office and submit a request for a print of your civil records (birth, marriage, divorce..etc) with the reason you need it. My mom wrote “to be submitted to American authorities for immigration” so they’ve printed the English version of it for her and stamped / signed it. She got an RFE for not sending the original but only the translation! So in December, my mom wrote the reason “personal use” and got a copy in her country’s language, then paid a translation office (to English again.) Then it got approved by USCIS. Crazy but true, what a comedy! We got RFE because in my country, birth certificate is not a hardcopy certificate. You go to Civil Records Office and submit a request for a print of your civil records (birth, marriage, divorce..etc) with the ﻿reason you need it. My mom wrote “to be submitted to American authorities for immigration” so they’ve printed the English version of it for her and stamped / signed it. ﻿﻿ She got an RFE for not sending the original but only the translation! ﻿ So in December, my mom wrote the reason “personal use” and got a copy in her country’s language, then paid a translation office (to English again.) Then it got approved by USCIS. Crazy but true, what a comedy! Great information, really appreciate the help and support. Thank you so much. Seems an Expedite was applied for, not obtained.